His image as a filmmaker is so good right now, with Argo receiving positive reviews since its screenings at the Toronto and Telluride film festivals, that Warner Bros. Pictures president Jeff Robinov is offering Affleck every script he has. "We're looking at a larger-scale film," says Robinov. Christopher Nolan, director of the Dark Knight trilogy, "is the prototype of where Ben would like to end up  making big movies that are commercial and have critical and social relevance. That's where he's heading." Affleck says he's up for a big superhero movie. "I like the idea of using all the toys and spending that much on visual effects to create a whole world. I just don't like the idea of doing it on top of a script that's not very good." His next movie might be about Whitey Bulger, the Boston mobster caught last year after 16 years on the lam. Terence Winter, creator of HBO's Boardwalk Empire, is writing the script, and Matt Damon has agreed to star. Damon, who just moved back to L.A. with his family, now lives down the street from Affleck, just as they did when they were kids growing up in Boston. Affleck is in two other upcoming films: Runner, Runner, a thriller about an offshore poker website, and To the Wonder, the new film from the reclusive director Terrence Malick. "I don't do much. I wander around," he says of Wonder. "I want people to know it's unusual. If you have pot, smoke it." For now, or once the press tour for Argo is over, Affleck will stay home with his kids  two daughters, ages 3 and 6, and a son, 7 months. And watching them is pretty complicated. Serious Affleck isn't so interesting to the tabloids, but the three little Afflecks are. "If I drive out and they see the kids aren't in my car, [the paparazzi] will wait for Jen. If they see Jen without the kids, they'll wait for me," he says. "We try to shelter them, but then they don't leave the house, and that's weird. I don't want my kids to be weirdos." They considered moving to New York City but found the paparazzi there even worse. "Kids are the big money now," he says of the celebrity press and its audience. "It's a lot of housewives who hold up their child rearing to the child rearing of these parents. 'Oh, they bought them this.' Or 'Oh, she's still breast-feeding.' It's kind of the way young girls look at whoever the young girl star is. And moms buy so much stuff." Even though he hates that his kids are bearing the tabloid sins of the father, Affleck says he's finally comfortable with being a celebrity. So as he leaves the hotel lounge after our interview, I'm not surprised that he nods at the two middle-aged women sitting next to us, looking at him. "Hi, nice to see you," he says as he gets up from his chair. "I have a Benjamin," one of the women says. "I call him Benny Boy. He's 22." "I'm sure he enjoys that," Affleck says. Other people, he knows, don't make it easy to move past your past. 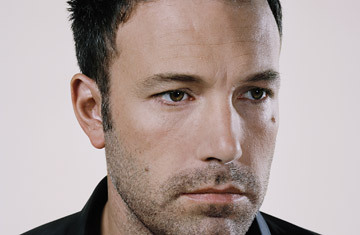 This article originally stated that Ben Affleck was behaving "drunkenly" during a 2004 video interview, a description based on viewing the video. Affleck's representative maintains that he was not intoxicated during the interview.